Two points connected tenuously by a holiday. The first comes from a post at The Economist (hat tip with more at the recently-enlivened Beeronomics), wherein the title says it all: "Why Guinness is Less Irish Than You Think." 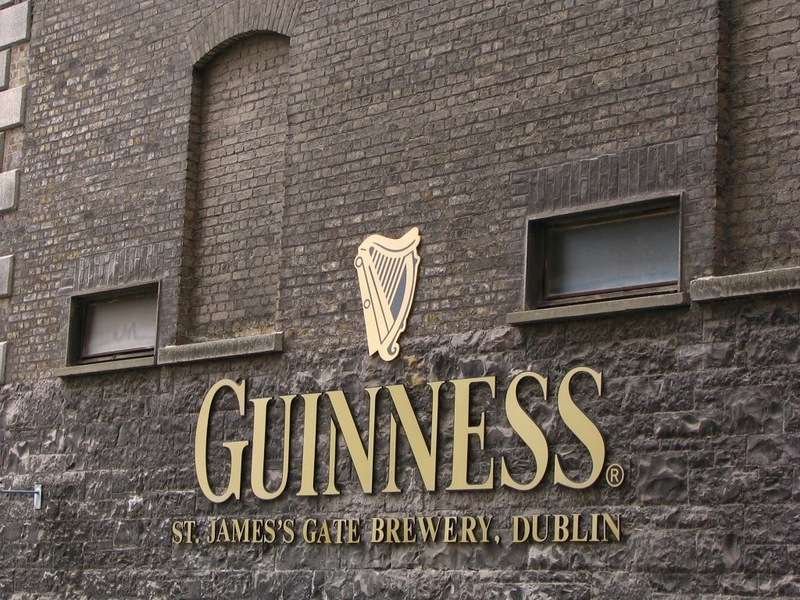 The writer can only muster a couple points to justify this Monday fodder (a blogger knows filler when he sees it): 1) Arthur Guinness was, 250 years ago, pro-British and 2) the giant corporation has many connections to London. The first one is especially lame, existing merely to give the thin post at least two points. The second one isn't much better, and the lead-in sentence is a good example why: "The beer the company has become most famous for—porter stout—was based on a London ale, a favourite of the street porters of Covent Garden and Billingsgate markets." Now, to segue awkwardly into the related topic: the strange spectacle that is the United States turning Irish for one day. Our good friend The Beer Nut regularly points out that whatever this cultural affectation that we have in the US is, it's not Irish. Fair point. I have an Irish-born friend who told me she was mystified when she arrived in America and met people who said they were Irish. She asked where they were from and they would say something like "Chicago." It would have been someone with a grandparent from Belfast. I understand that from a European perspective this seems bizarre, and until I visited Europe, I was in total agreement. Now I think its the Americans who have things right. History is not a tangible thing. It's the story we tell to explain ourselves. It's why Orwell's 1984 is so profound--the entire narrative hangs on his famous sentence, "He who controls the past controls the future." It's a lot easier to control that past when there are remnants of it sitting in your home town. If you happen to have, say, extant Roman or Celtic artifacts in your town, it gives form to the stories. I grew up in one of the most recently-settled parts of the US (by Europeans, anyway), and we used to treasure our hundred-year old water pumps and wagon wheels. You work with what you have. But part of America's history is our European heritage. If your family has lived in Dublin for ten generations, you get to call yourself Irish. If your family lived for ten generations in Dublin and then moved to New York, do you lose that history? The Irishness that Americans celebrate is different than Irish Irishness, but it's no less real or authentic. Our ancestors arrived on this continent ten or a hundred or 500 years ago (and that includes most Native Americans, who at this point have histories as fragmented as my own), but that's not when their history began. So I say put on your green shirt, go hoist a pint of Guinness (or better yet, a Porterhouse Plain, if you can find it), and offer a sláinte or three. There is nothing "uniquely irish" about dry stouts. Or red ales, for that matter. Or Scottish ales, which are also not brewed with peated malt or carmelized in the kettle. You are incorrect sir, though you offer no rebuttal to my data, so it's difficult to rebut your one-liner. Black malt, Jeff? Got a citatation for that? One that wasn't just made up? "While all the porter brewers eventually used Wheeler's patent malt, the London brewers continued to use brown malt in their porter mashes... But in Ireland, within a few years of the invention of patent malt [in 1817], brewers were abandoning brown malt entirely. Guinness, for example, which had been using between 25 per cent and 47 per cent brown malt in its port up to 1815, was probably using only pale malt and patent malt by 1824 and certainly by 1828. The result was divergence in flavor between Irish porter (and stout) and London porter (and stout), with the former now drier, less sweet (because the pale malt fermented out more fully than the brown and amber malts that the English brewers used) and, because of the burnt flavors from the patent malt, more bitter." Martyn's discussion of roasted barley is here. I am not a historian, so I rely on the work of those who are--admittedly, a weakness. But nevertheless, I've shown you mine, now, preferably in something other than dismissive one-liners, would you gents care to show me yours? It's not really a historical question, but one of ontology. Does changing brown for patent malt change the essential nature of a porter? Which is to say, a dark beer of the style made in the UK, made like most UK beers of a combination of UK-style pale malt and cereal adjunct, with UK style top fermenting yeast and UK-style hops. All beers made in the region are made using similar styles and methods, so the "irish" type is at best a subtype, and one I'm not convinced exists, given that brown malt was phased out almost entirely over the next few decades. Now what DOES change the essential nature of the beer is changing out the yeast for one that performs better (and bottom ferments) in a conical fermeter, for cheaper, high AA ignoble hops, and lower quality base malt. Which virtually every american brewer of "dry irish stouts" do. I think you're pinning too much on slight variations in recipes, Jeff. There's a very good side-by-side comparison of London porters with Guinness in the 1860s-1880s on Ron's blog here. Yes, the Londoners had 10-20% brown malt, but there's also 10% amber in Guinness -- something neither yourself nor Martyn seem to have allowed for when highlighting the supposed differences. The black malt percentages are pretty much the same across the board in both cities -- so much for "In London, they continued making porter the same way", right? Moreover, if you're pitching for a difference in dryness to separate the styles, then surely attenuation is key. Have a look at the gravities set out here: about 70% across the board. Would anyone describe a 70% attenuated beer with 5% black malt as "dry"? I've certainly never seen anyone say so at the time. Why is there no reference to the famous, distinctive dry Dublin porter before the late 20th century? My guess is: because it wasn't a thing. Nobody saw Dublin porter as being stylistically different to London porter. All right, now we're cooking; thanks for the fuller replies. I think you're right, Daniel--we're into style ontology here, and that's always a dicey prospect. It seems we're all agreed about facts and differ on interpretation. From the distance of the 21st century, it looks inevitable that brown malt would fade and that English stouts, with or without the influence of Dublin, would move to the standard pale plus a dab of black. But I actually take the evidence from Ron and interpret it exactly the other way. By the late 1880s--more than fifty years after Guinness dumped brown malt--English brewers were still using it to flavor their beers. By that point they were well aware of the efficiency of pale malts, so they were sticking with brown because it gave a certain character. The lines had diverged. Enough to call it a separate style? Well, that wasn't the end of the story. When Guinness shifted to the use of roasted barley around 1930, that's when the characteristic "dryness"--the distinguishing feature of Guinness--came in. Irish stouts went through a process of becoming. But I don't see how you can look at the current type of Irish stout--4%, made with roasted barley and no brown malt--and find much similarities with 19th century London porters, which were much larger beers flavored with brown malt. If we had a time machine and could take a case of modern Guinness back to London circa 1820, no one in the pubs would call it a porter. It is the difference between modern American IPAs and English IPAs (the 3.5-5% ones made to be served on cask, not the ones craft breweries are making in the "American style"). Export lagers and hellesbier is FAR closer to pilsner than modern Irish stout is to London porter. The changes that Irish stout went through to become its modern incarnation largely happened in Ireland, not England. I am don't see any way to argue that it's not a unique style of Ireland. Guinness is simply a descendant of 1700's London Porter. It didn't dramatically diverge after adoption of black malt. It continued, as Beer Nut pointed out, to use amber malt, which isn't all that different from brown, or needn't be at any rate. Today Guinness uses a lot of flaked (unmated) barley, but 1970's English stouts would have used a lot of sugar and maybe lactose. Both types surely used less hops than 100 years before. Guinness is simply a modern, altered variant of 1700's London Porter, just as Mackeson Stout is the ditto. It isn't "dry" vs. London "sweet". Ron and I think Martyn too, later (after the book you mentioned), showed that the palate of English stout in the 1970's could be dry or sweet. Gary, I don't think I ever disagreed that it's not a "descendent." But do you argue that helles and Dortmund don't exist? In any case, your judgment is a subjective one, and to it I retort: try the everyman rule and see if people think Guinness and 18th century London porter are the same. They are radically different. Well, I would agree stout is Irish, as viewed anywhere, to the extent that porter and stout in their native land became almost extinct. Since the tradition was carried on elsewhere and became identified with that place, fair enough. I agree with the posited everyman on that. I agree too that the palate of Guinness has diverged from the 1700's and 1800's porters, and that helles and Dortmunder are a useful distinction: maybe our disagreement is semantic, at bottom. About American ethnic Irishness: the point about a Belfast grandparent was telling, because apart from the "dilution" factor, I think your friend meant that many Americans are of Scots-Irish background, usually partially so at this point. And the Scots-Irish were generally of English or Lowlands Scots background, Anglo-Saxon not Celts (is my understanding), and Protestant. Of course, many North Americans have ancestors born in the Republic of Ireland and of Catholic background but the Scots-Irish were an earlier emigration, an important one in American history. Gary, if we come to agreement on a comment thread to a blog post, the internet will break. Won't someone please think of teh children? !